Do you have a hidden agenda? I’m not talking about a secret or mysterious plan. It’s a method of concealed carry that’s very surreptitious. It’s called Hidden Agenda from Galco, and it’s an alternative for women and men that must dress professionally for work and may not choose to carry a briefcase or wear a concealed pistol on their person. 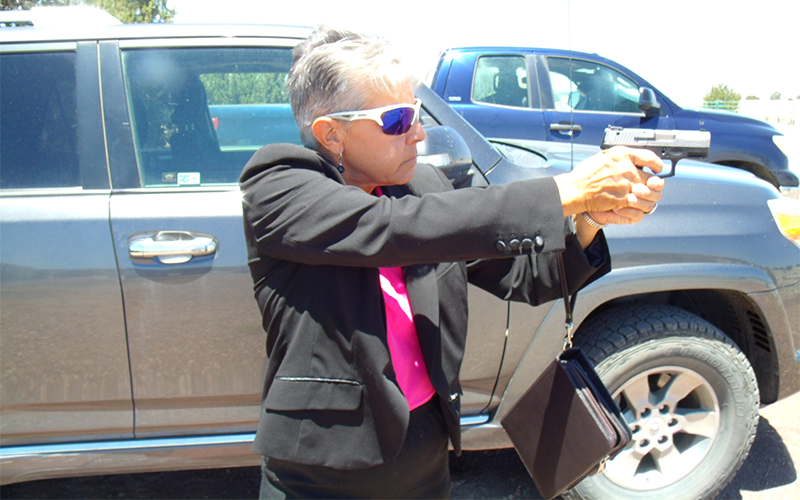 A woman wearing a pant or skirt suit may not be able to carry a pistol on her waist or wear a shoulder holster. The materials used in women’s clothing is sometimes too fragile to accommodate weight on waistbands or around the shoulders. Maybe a concealed carry purse is too heavy, inconvenient or obvious. If wearing a pistol on his waist, a man’s suit-coat may imprint if it’s too tight, particularly if he buttons it, or temperature may preclude the wearing of a coat which would conceal a waist or shoulder holster. A briefcase may be old-fashioned or cumbersome. If either of these individuals require the use of a calendar, day planner and note paper, and they are concerned about their personal protection, an alternative is the Hidden Agenda. It’s all in one neat little package. Once out of the packaging, I could see the Galco Hidden Agenda looks like a basic hand-held agenda bound book. 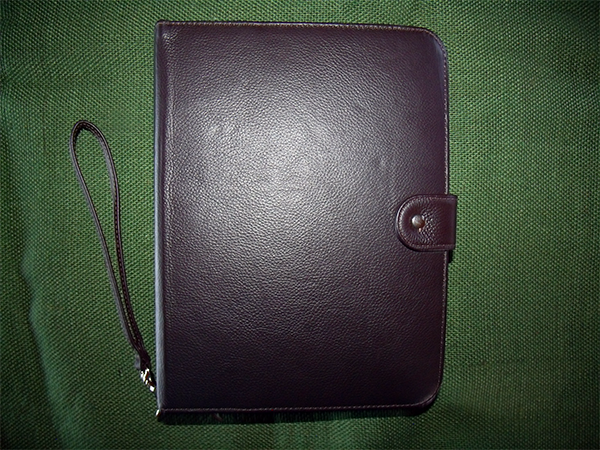 Measuring 9-1/2” X 7” X 2-1/2”, the full grain leather is of fine quality like Galco’s handbags. It is fully ambidextrous and available in black or brown. A removable wrist strap is located on the bottom of the front cover. 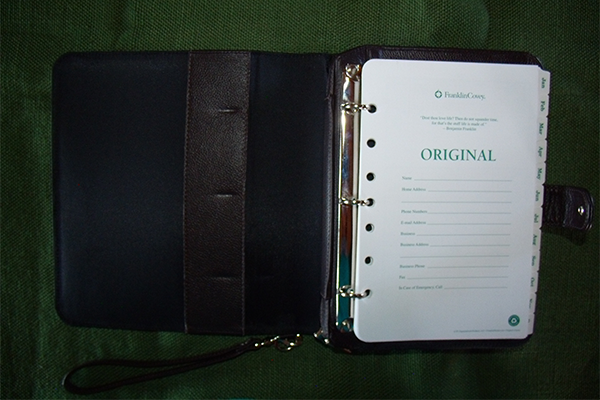 The front cover snap is the entry way to the AGENDA, a fully functional day planner on a three-ring binder. This is called the Day Runner Calendar and behind it a pad of ruled paper. There is enough room in the three-ring binder to carry other paperwork of the proper dimensions, 8-1/2” X 6”. What is hidden behind the pad of ruled paper is the reason for its design. Separating the front compartment from the back is a heavy-duty zipper surrounding the HIDDEN pistol compartment contained inside. 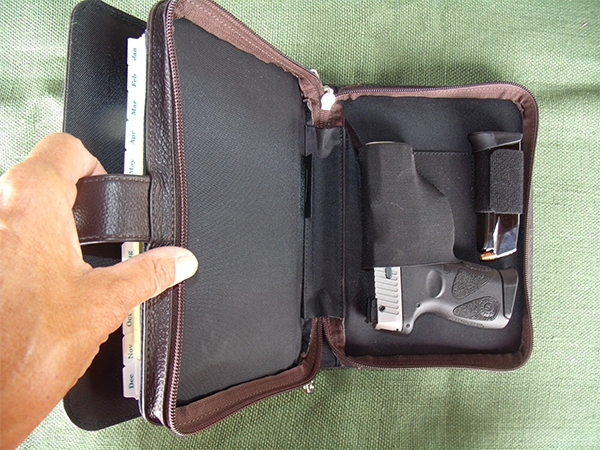 This compartment is padded to prevent printing and has a lockable nickel zipper pull which is great for keeping the pistol out of the hands of children or adults. Inside the compartment is a holster and magazine loop, both elastic to accommodate most semiautomatic pistols and small revolvers. What I notice immediately is the HIDDEN AGENDA’s compact signature. It fit comfortably on my arm as I carry it like a book, or in my hand as I carry it at my side. I look like I’m going into an important meeting. When placed on a table, it looks quite innocent in appearance. It’s very unobtrusive and as such, inconspicuous. For one day I carried it around town instead of my concealed carry purse in settings that “required complete discretion.” Nobody paid attention as I lay it on a table or counter, opened the front compartment to remove brochures I was distributing around the local businesses. If anyone wonders what is in the back compartment they could imagine it contains more brochures, business cards, a phone or several other business-related items. That’s what I will tell them if they ask. Certainly, in their mind a pistol will be far down the list. Today’s professionals need to be concerned about appearances as well as their own security. Even though HIDDEN AGENDA is attractive and inconspicuous, I’m more concerned about the ease of draw of the pistol which is totally zipped into the back compartment and held firm within the elastic. How am I going to get to it if needed? To answer this question, I used my Taurus PT111 G2 and discovered that the pistol can be draw from two different directions dependent upon the placement of the HIDDEN AGENDA on a table or being held on my arm. As an example, with the book in front of me and open between the calendar and pad, if a threat presents itself, unzipping the back compartment will be done at the bottom of the pad just enough to allow my hand to insert into the compartment to grab my pistol and pull towards my body. Of course, this may require the assistance of my other hand to steady the book or conceal what I am attempting to do. There is enough room (depth of 1-1/2”) and enough give of the leather material, so I don’t have to unzip the compartment all the way around. When time is of the essence, you look for ways to cut the seconds off your response. Walking or standing, holding the HIDDEN AGENDA in my left arm, as I’m right-handed, I must hold it with the zipper pull and wrist strap at the top as I look down at them. The wrist strap is around my left hand. From this position I can unzip the back compartment approximately 7-1/2” with my right hand, insert my hand through the top, grab my pistol and pull upwards. At the same time, I drop my left-hand grip of the book, allow it to fall and hang by the wrist strap as I bring my left hand up to my right hand to get my two-handed grip. The measurement of the holster is 4” in length and 3-1/4” in width. It narrows to 2” width where the barrel or slide will rest and the barrel length if longer than 4” will protrude beyond the end of the holster. The elastic can expand outward to fit a slide of 1-1/4” width. I tried a full-size Colt 1911 and it fit, though with little room in length to spare. The width of the slide is 3/4”. The width of the slide of my Taurus G2 is 1”, and therefore fit perfectly. I tried my full size XD9 and at 1-1/4” width, and the slide fit but it is a struggle to get it in place as the material was at the maximum give. The issue I had then, was removing it from the holster. There is considerable delay as I floundered. The problem with some of the longer than 4” barrel semi-autos has to do with the front sight which rests outside the end of the holster, will catch when an attempt is made to remove it. The Charter Arms .38 revolver with a 2” barrel fit. The S&W M10, 4” barrel, did not fit but not because of its’ length. What are “most semi-automatic pistols and small revolvers” mentioned earlier, that the HIDDEN AGENDA will hold? 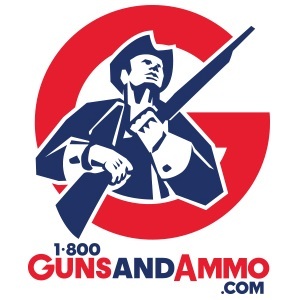 The following manufacturers provide pistols, both revolver and semi-autos, that will fit in the holster: Beretta, Bersa, Canik, Colt, Glock, HK, Kel Tec, Kimber, Magnum Research, Remington, Ruger, S&W, Sccy, Sig-Sauer, Springfield, Taurus and Walther. I advise that when selecting a pistol for the HIDDEN AGENDA you pay attention to the pistol’s specific dimensions on length, width and thickness as found in the advertisement. 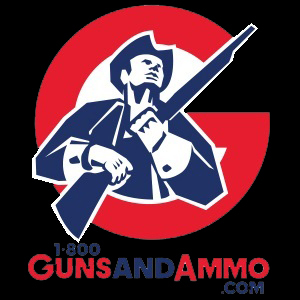 The slightest diversion from the specific dimensions may make all the difference as to the fit and subsequently your ability to draw from the holster successfully. In conclusion, the Galco Hidden Agenda is a wonderful concealed carry option. 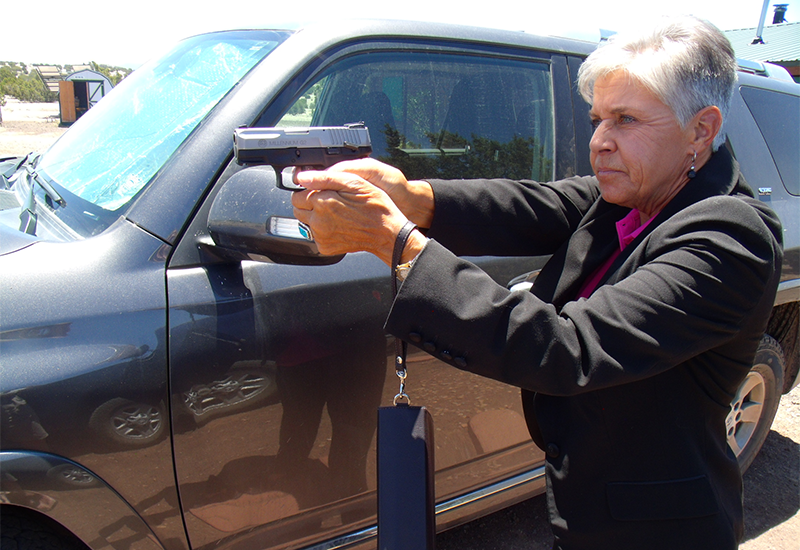 This is a great alternative to women and men who don’t have the ability or desire for on-body methods of concealed carry. As I said earlier, “it’s all in one neat little package.” Galco has a winner.